IBASSIN: Bradley Hallman Wins 2016 Walmart FLW Tour Lake Okeechobee with 71-02 Pounds! IBASSIN is your first choice for all things bass fishing. Tournaments, new lures, articles, interviews and resources centred around bass fishing. 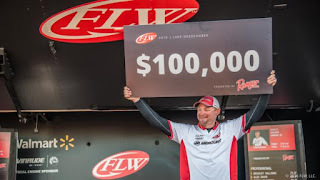 Bradley Hallman Wins 2016 Walmart FLW Tour Lake Okeechobee with 71-02 Pounds! Wire to wire win while weather worsens. Bradley Hallman is fishing his first season on the Walmart FLW Tour, but he is by no means a rookie in the world of tournament bass fishing. Hallman spent six years as a pro on the Bassmaster Elite Series from 2006 to 2011, so he knows his way around the business of bass tournaments pretty well. Two 25 pound limits allow Bradley to ride out rough weather for win. During his six years on the Elite Series, Hallman encountered some pretty stiff headwinds that forced him to retreat from the national level of the sport. From his pro experience, Hallman learned a very valuable lesson. This week marks Hallman’s return to national-level fishing on the FLW Tour, and he made a tremendous comeback – his way – by notching his first national-level win at the Walmart FLW Tour event on Lake Okeechobee presented by Ranger Boats and hosted by Roland and Mary Ann Martin’s Marina and Resort and the Hendry County Tourism Development Council. One thing is for sure, Hallman’s commitment was certainly tested by wicked high north winds on Lake Okeechobee and wicked extreme frontal conditions that pestered the lake’s Florida-strain bass. Day two dealt out high north winds of some 25 mph. On day three the wind subsided, but the post-frontal conditions shut the bite down considerably. Day four, however, ravaged the top 10 pros with a brutal triple whammy: high northwest winds to 30 mph, dropping water temps and complete post-frontal lockdown of Okeechobee bass. Through it all Hallman pitched and punched reed heads in South Bay. For that reason, Hallman ordered two custom-built rods from Mosley RodWorks in Oklahoma that are specifically designed for punching and horsing giant bass out of vegetation. The rods are 8 feet long and feature a parabolic bend to load up on fish in mats. On the business end of his rig, Hallman relied on a Reaction Innovations Sweet Beaver 4.20, a 1 1/2-ounce tungsten weight and a 4/0 Strike King Hack Attack Heavy Cover Flippin’ Hook. The soft plastic colors he used included electric blue, hematoma and penetration. He added a punch skirt (black/blue) to his punching rig, believing that the skirt added more potential for a bigger bite. With the brutal conditions on the final day, Hallman downsized everything, going to a Gambler BB Cricket with no punch skirt and a 3/4-ounce weight. “When the water temperature starts dropping in Florida, going smaller is a big deal,” he adds. Hallman notes that the more isolated reed heads were better, especially earlier in the week. Combatting the harsh winds on days two and four was an integral part of his victory. This was especially true on day four when he lost use of his trolling motor and had to use only his outboard, a push pole and Power-Poles for boat control. To overcome the situation, Hallman let the wind push him into a reed head or clump, engaged his Power-Poles, turned his back to the wind and then essentially pitched, or even tossed, his punching rig far up into the heart of the reeds where matted vegetation was trapped in the interior of the clump. Hallman built a sizeable lead of 13 pounds, 9 ounces going into the final day. And as it turns out, he could have stayed in bed on the final day and still won. Conditions were so extreme that no one even came close to threatening his lead. He did, however, bring in two bass weighing 6 pounds, 8 ounces to secure victory on the final day. Fishing & Hunting Retailers Epic Battle? Learn from the very best. Blogs, Videos, Photos and resources will help anyone who loves to fish catch more. Get the latest info from the tournament trail, manufactures, and the coolest stuff out of Japan. Travel theme. Theme images by PLAINVIEW. Powered by Blogger.